The mix of fuels making up the U.S. power sector is constantly evolving, responding to market forces including the changing price of fuels, the mix of new generator construction, government policies such as renewable portfolio standards, and technological improvements. As the share of U.S. electricity that is being generated from renewable energy and natural gas continues to grow, increasing focus is being placed on ensuring adequate and reliable baseload generation at a time when traditional baseload energy sources are being replaced with non-dispatchable, or intermittent, power generation. Generation from a baseload plant is defined by the Energy Information Administration (EIA) as a plant that “is normally operated to take all or part of the minimum load of a system (i.e., the "base" load), and which consequently produces electricity at an essentially constant rate and runs continuously.” Baseload power plants do not change production to match power consumption demands. Historically nuclear power, coal-fired plants and natural gas combined cycle plants filled this need for system operators. In this context, baseload power is essentially referring to the reliable and dispatchable energy sources that are typically operated on an around the clock basis. Baseload generation specifically excludes power from intermittent sources of energy such as solar and wind because electricity cannot be reliably generated from them when the sun isn’t shining or the wind isn’t blowing. Because natural gas is also used for heating needs, extreme cold conditions can sometimes prompt an increase in natural gas use by regional gas utilities that can result in little to no gas pipeline capacity available for use by electric generators, reducing their ability to provide baseload generation in these circumstances. The recent debate surrounding baseload generation compared with non-dispatchable energy resources has become increasingly prevalent due to market forces flipping the script from decades past. Historically, coal was the cheapest fuel and thus made up a majority of the electric power generation in the United States. After the initial capital costs of building a power plant, nuclear power was always among the cheapest energy sources as well. However in recent years, natural gas prices have plunged to all-time lows and renewable energy costs are constantly dropping, setting up situations where the baseload generators are no longer the cheapest sources of energy, with coal-fired and nuclear plant retirements increasing with no new baseload plants replacing them. Combine those market forces with debates surrounding the environmental impacts of nuclear power and the climate concerns related to coal, and the new normal is that the non-baseload fuels are accounting for an increased portion of the U.S. energy mix. 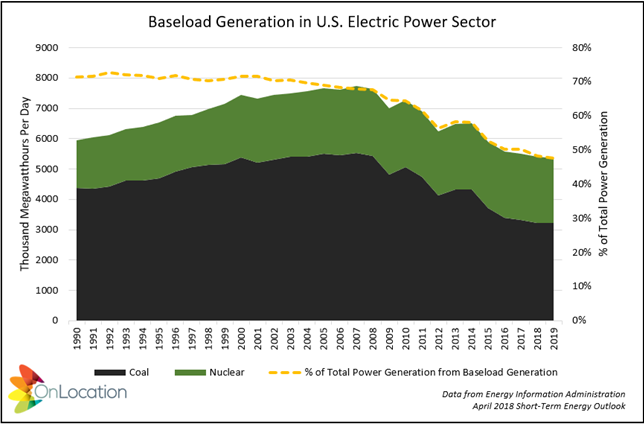 According to the EIA, coal and nuclear still accounted for a combined 50% of total U.S. electricity generation in 2017, but that’s trending down from 68% just a decade earlier, with that trend forecast to continue and drop baseload power to 48% of the total mix by 2019. For all the evident benefits of an energy mix increasingly relying on clean energy sources like renewables and more affordable fuels like natural gas, several concerns have arisen connected to these changes. When baseload generation was the cheapest source of energy, the ISO markets operated to ensure the reliable operation of the grid and these generators were adequately compensated, but now that cheap natural gas and renewable generation are often more competitive, market forces alone are not necessarily enough. Further muddling the waters are the competing claims from nuclear plants and electric power markets regarding whether the closing of nuclear plants threatens overall grid reliability. For example, when solar generators are working at peak capacity during the middle of the day, baseload generation plants must continue to maintain a minimum level of operation, resulting in situations where there is an overabundance of energy on the electric grid that cannot be used by its customers and cannot yet affordably or efficiently be stored for later use. Not only is this scenario inefficient in terms of wasted energy, but much of this power generated during the day ends up priced at zero or even negative prices, so baseload generators must sell their power at a loss during those hours. Other pro-nuclear laws in Connecticut, Ohio, Minnesota, and more. How the debate about market failures and inefficiencies impacting baseload generation in an increasingly non-dispatchable energy mix, and the government’s role in mitigating those impacts, will be resolved is anyone’s guess. But in a time of fast-moving technological innovation and quickly-changing market forces, staying aware of the situation and how it evolves is critical to every stakeholder in the electric markets. To learn about how OnLocation can help you explore issues related to energy and the electric grid system, visit http://www.onlocationinc.com/contact-us or contact us at contact@onlocationinc.com.